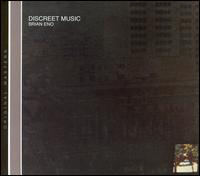 Discreet Music (1975) is the fourth studio album by the British musician Brian Eno. While his earlier work with Robert Fripp (No Pussyfooting) and several selections from Another Green World feature similar ideas, Discreet Music marked a clear step toward the ambient aesthetic Eno would later codify with 1978's Ambient 1: Music for Airports. It is also Eno's first album to be released under his full name "Brian Eno" as opposed to his previous rock albums released simply under the name "Eno". This album was re-released on the Virgin label.[when?] On CD reissues, a full minute of silence separates Discreet Music's title track from the Pachelbel piece. For the 40th anniversary (2015) of the release of the album, the Canadian music ensemble Contact recorded "Discreet Music" with classical instruments as a seven-part one hour work. ^ a b Westergaard, Sean. 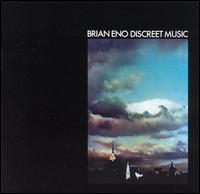 "Discreet Music – Brian Eno". AllMusic. Retrieved 3 February 2018. ^ Suchin, Peter. "Brian Eno and the "Quiet Club": Subtle Beauty as Social Critique". /seconds. Retrieved 19 August 2012. ^ a b Singer, Liam (7 October 2004). "Brian Eno / Harold Budd: Discreet Music / Ambient 1: Music for Airports / Ambient 2: The Plateaux of Mirror / Ambient 4: On Land". Pitchfork. Retrieved 20 February 2013. ^ "Brian Eno Tells The Origin Story For Ambient Music". Synthtopia. 5 January 2016. Retrieved 11 May 2018. ^ Gagné, Nicole V. (2012). Historical Dictionary of Modern and Contemporary Classical Music. Scarecrow Press. p. 90. ^ Sheppard, David (2008). On Some Faraway Beach: The Life and Times of Brian Eno. Hachette UK. ^ Barnes, Mike (October 2004). "Brian Eno: Discreet Music / Music for Airports / On Land / The Plateaux of Mirror". Mojo (131): 127. ^ Considine, J. D. (2004). "Brian Eno". In Brackett, Nathan; Hoard, Christian. The New Rolling Stone Album Guide (4th ed.). Simon & Schuster. pp. 278–279. ISBN 0-7432-0169-8. Retrieved 30 April 2011. ^ Weisbard & Marks 1995, p. 129. ^ Pinnock, Tom (January 2019). "Brian Eno: Discreet Music / Ambient 1: Music for Airports / Music for Films / Ambient 4: On Land". Uncut (260): 38. ^ Christgau, Robert (27 June 1977). "Christgau's Consumer Guide". The Village Voice. Retrieved 3 February 2018. ^ Grant, Steven; Green, Jim; Robbins, Ira. "TrouserPress.com :: Brian Eno". TrouserPress.com. Retrieved July 4, 2016. Weisbard, Eric; Marks, Craig, eds. (1995). "Brian Eno". Spin Alternative Record Guide. Vintage Books. ISBN 0-679-75574-8. This page was last edited on 7 March 2019, at 22:32 (UTC).